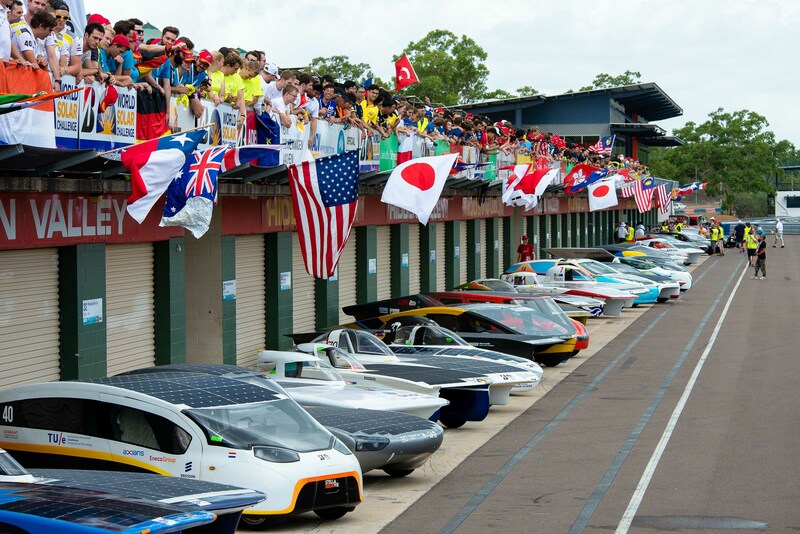 The Bridgestone World Solar Challenge is getting closer. The last days before the start on Sunday, are all about official examinations and tests. Because the challenge is taking place on Stuart Highway, being a public road, every solarcar needs careful inspections, especially the technical details must function flawlessly, to prove the road worthiness. 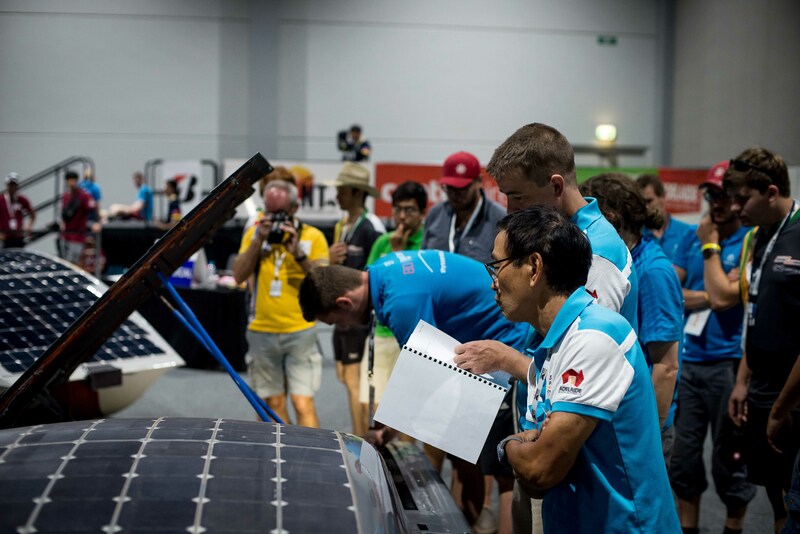 During the static scrutineering, the BWSC officials are examining the dimensions, the weight, and the correct processing of each component. Every solarcar needs to pass this inspection in order to participate in the challenge. The blue.cruiser was welcomed by an impressed crowd when entering the Darwin Convention Center. The solarcar immediately received a new name: “Bond…James Bond” was the comment by the events social media team via Instagram. The whole team from Bochum appreciates this compliment, implying the elegance of an Anston Martin. However, not the design lies in the judge’s focus, but rather the car’s technical inside. Quickly, it becomes clear that the judges are not here to play around and they take their job seriously to ensure everyone’s safety. All electrical matters passed without any objections and on the contrary the electrics were praised for the innovative work they have done. The electrical team not only adhered exemplary to the guidelines of how to wire the solar array, but actually stood out due to their innovative solution, that made the judge considering the wiring from Bochum to become a new standard regulation, perhaps. 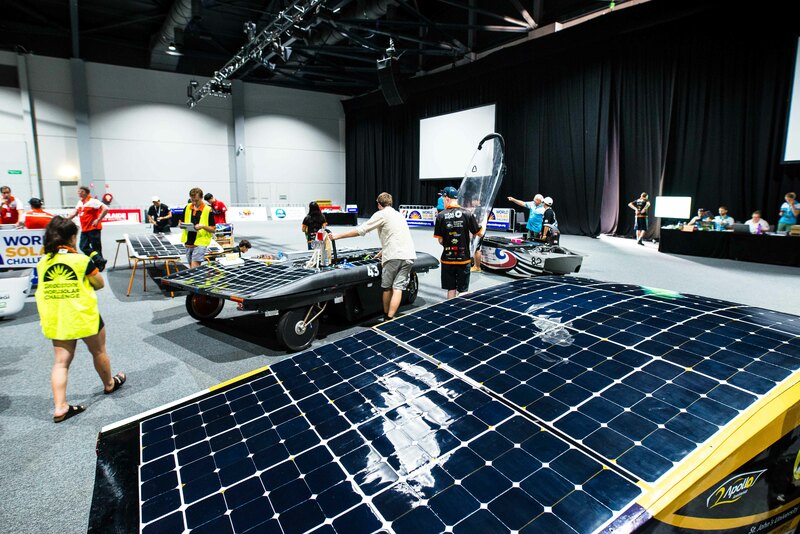 At the last station, where the battery was to be examined, the time ran out and the team had to leave the Convention Center without accomplishing every station and without receiving the important green sticker. This inspection must be postponed to the next day. The first day of scrutineering came to an end at the Hidden Valley Race Way. The event’s organizers throw a huge welcome BBQ party for all participating team to get to know each other and the evening was a nice change before the upcoming second day of scrutineering. The waiting was all worth it: the battery was accepted straight away. The smaller issues concerning the stickers, questions about the safety belts, and the positioning of the tracker box were resolved. The safety concerns about the steering system could be eliminated by the explanations of the team’s engineers. Now, all stations are accomplished and the blue.cruiser is ready for the track.